Agree or not, a man with a perfect beard is just too drool-worthy. Literally, girls go weak at the knees for him. But for men, maintaining a perfect beard is like reading a girl’s mind which is likely to be the most difficult task for them. Well, I can’t help you with your mind reading capability but yes, for the beard, here I have put together the top 10 best beard trimmers for you. With the help of these razors, you can embrace any beard style and manage it like a boss. Not only the trimming, you can also have the clean shaving with these beard trimmers. True to its name, it is indeed a complete kit to manage your beard. The kit comprises of 8 types of trimmers and combs. Want a beard trimmer, foil shaver, nose & ear shaver, and hair clipper comb altogether in one razor? Get RemingoPG6025. All of these attachments are washable and detachable. You can insert any of them as per your needs and after trimming, you can rinse them off without any worries. It comes with a Lithium battery which ensures the 65 minutes cordless runtime. The blades are extremely sharp but you can have a safe shaving without nicking the skin. 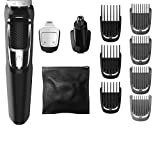 If you want something more than Remington PG6025, SUPERENT Beard Trimmer kit might be a good fit for you. It is costlier and more functional as compared to the earlier one. 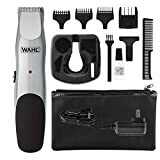 It comes with the 4 hair clipper combs for hair cutting, 4 adjustable combs for a flawless trimming, and 3 full-size adjustable hair trimming combs. Means, it can meet all your grooming needs. It is also inbuilt with a durable Lithium battery which provides a 60 minutes long runtime. For a smooth shaving experience, the blades are made of 420-stainless steel. Philip Norelco beard trimmer is not as much ultra-functional as SUPERENT Beard Trimmer kit but will surely meet all your basic trimming needs. 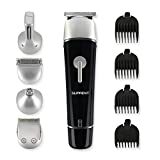 Featuring 5 attachments such as nose trimmer, precision trimmer, full-size trimmer, hair comb, and beard comb, it offers a safe and seamless trimming experience. The battery runtime and design are almost similar to other beard trimmers. To switch between the different modes of trimming and combing brushes, just hold the upper portion and turn it around. It should have been named the entire kit of grooming. From the several types of hair combs to the multi-functional different blades, it comes with almost 12 attachments. You can put on any tool within the seconds and groom yourself the way you want. If you’re too much lazy for plugging in the devices every time you have to use, then get this one. Charge once and use up to 2 months. And the best of all, enjoy a 3-year long warranty. 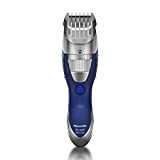 If the above-mentioned Philip Norelco beard trimmer was not a good fit for you just because the unavailability of huge numbers of tools, consider buying this one. It features an extensive range of 11 attachments, each of them having a different functionality. It comes with an extra feature called ‘Dual Cut technology’ which ensures the maximum precision and safe cutting ease. The other thing you’ll find mind-blowing about this beard trimmer is its tempered steel blades which are not easily broken. 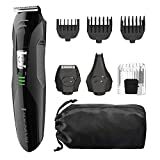 If money is not a considerable fact for you while buying, Wahl Beard Trimmer Lithium Ion grooming kit might be the best fit for you. It doesn’t come with any unwanted tools and complex set up but you’ll find all the accessories that you need for the grooming. With its rounded and smooth blade tips, Wahl Beard trimmer lithium Ion grooming kit provides an easy and irritation-free shaving experience. The powerful lithium battery allows the 3 hours long runtime. 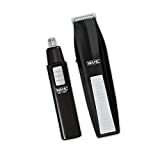 If you want a simple, low-priced, and good-quality beard trimmer, Wahl Beard Trimmer with Bonus Personal trimmer is designed for you. In this list, it is the cheapest beard trimmer. There aren’t many complex and confusing functions in it but it will make sure to style up your beard in every possible way. Apart from the beard and mustache grooming, it also helps you cleaning the unwanted hairs of hard-to-reach body parts. With its 2-years warranty and such an affordable rate, this beard trimmer is surely a head-turner. Here comes one of the most stylish, costliest, and ultra-functional beard trimmers on our list. It doesn’t come with the separate tools rather it is inbuilt with 19 trimming functionalities. With this beard trimmer, you don’t have to remove and insert the needed tool manually every time. 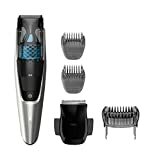 Just turn on the quick adjust dial and set your desired trimmer or hair clipper out of 19 features. The electric Panasonic Milano bread trimmer is water resistant, so don’t hesitate cleaning it freely. It comes with the rubber grips which allow a firm hold and a seamless trimming operation. Philip Norelco 7200 is an expansive and super smooth beard trimmer. 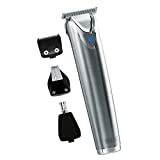 With its 20 inbuilt trimming features, this beard trimmer offers you every single functionality that you can find in any other beard trimmer. Moreover, it comes with an integrated vacuum system which stores the cut hairs and prevents the mess on the floor. With the help of self-sharpening steel blades, you can have an effortless and flawless hair trimming. Just press the button and select your needed blade setting from the zoom wheel. And you’re ready to go. The last spot is occupied by the costliest beard trimmer of our list. It is not too stylish and ultra-functional beard trimmer but is totally worth of its price. 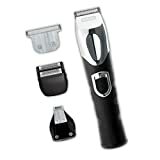 It comes with 4 attachments named precision T-blade, detail shaver, detail trimmer, ear, nose, and brow trimmer. The best thing about this product is its reliability and high-performance capability. If you get cuts or nicks while shaving, get this one. It promises a smooth trimming. So, already grew your beard but now find it hard to manage? Well, get one of these top 10 best beard trimmers and make the world notice you.